Gail is a Filipina author based in the Philippines. She runs a design studio with her husband in the outskirts of Metro Manila, but also does freelance copywriting on the side. When not in front of her computer coding a website or writing a story, you’ll find her in the backyard, playing with four dogs, six ducks, a chicken, three turtles, and a cat. Gail writes historical fantasy and contemporary novels with a dash of magic for middle grade readers. Her fiction is represented by Alyssa Eisner Henkin of Trident Media Group. I’m currently on submission for a middle grade contemporary set in Metro Manila. This is the second book I’ve queried, and the book that caught the attention of my agent. I’ve been querying for a year and a half before I signed with Alyssa, but the journey was well worth it. I learned a lot, and I feel like I’ve become a better writer with every rejection and revision I’ve done on both books. I’ve been on both ends of mentoring—as mentee and mentor. I’m a proud protégé of middle grade maestro, Kate Messner, whom I met through the Writing in the Margins mentoring program in early 2016. I’ve worked with Erin Entrada Kelly and Anica Mrose Rissi too, and learned a lot on the craft of writing and the publishing process from them. For Pitch Wars 2017, I’m co-mentoring MG with my writing BFF, Isabelle Adrid. I was a mentor for Author Mentor Match Round 2, so of course, I’m back for the third round. In addition, I critique for both agented and un-agented authors. I believe it’s primarily their hard work and perseverance that got them representation offers or book deals. Still, I’m glad to have been part of their journey. I also do sensitivity reads every now and then, focusing on the portrayal of Filipinos and the Philippine culture in fiction. I love being a mentor for two reasons. First, I want to pay it forward. I became better as a writer through the generosity of my own mentors. I’d love to do the same for my mentees, sharing with them all I’ve learned and more. Second, I want underrepresented kids to see themselves in books. I rarely saw myself in the books I’ve read when I was growing up, and I’d love to change that. Through mentoring, I hope to help an author polish a manuscript which can one day be a lifeline to marginalized children. I love all things MG—well, almost everything. I tend to shy away from high fantasy. I’m easily scared, so I’m not the best mentor for horror stories. But generally, I’ll take in a manuscript with a strong voice that I can connect to, and make me feel like a kid again. #Ownvoices preferred, but not required. Bonus points for unique settings and family stories. Extra bonus points if you can weave in social issues and cultural constructs seamlessly, and without being preachy. More than anything, I want a mentee who is willing to work as hard as I intend to, and be able to handle criticism well. Together, we’ll do what we can to make your manuscript and submission materials shine. In SFF, I love Historical Fantasy, Alternate History, Light Science Fiction, and Steampunk. “Dead/dying parents/siblings/family/friends/pets/etc.” trope (yes, please!) – I love books that can make me feel, especially the ones that handle grief and recovery well. “White Savior” trope (absolutely not) – as a brown Filipina living in her native, post-colonial country, the idea of “white savior” stories (ex. a displaced Caucasian character ends up living with natives/POC and becoming their greatest warrior/leader who alone can save them) irritates me. Say what you will, but if your book has this trope, I’m definitely not the mentor for you. I usually read manuscripts once as a reader, to enjoy it and see how everything falls into place. I leave comments on my second read, noting both the things I love and those I feel can be improved. I’m not mean, but I am straight to the point. My editorial letters are very detailed and organized—they tend to run long. I include resource links if I need to, and book recommendations if applicable. I’ll explain to you why I think something doesn’t work, and let you decide to take the suggestion or not (of course, I’ll do everything to convince you if the issue in question is hurtful or offensive). I do at least two rounds of editing. First, the structural and big-picture edits. Once you’ve nailed those revisions, we move on to the next round, where I’ll give you line-edits. Thing is, it doesn’t really matter how many times we go back and forth. I’m in this for the long haul—I want to be there to see you reach your goal, no matter how many manuscripts, query letters, or pitches it will take. My ideal mentee is hardworking and willing to learn. They’ll have a sense of humor, a positive outlook, a thick skin, and a drive to succeed. NOTE: I won’t require you to disclose sharing a marginalization with your main character if you’re not comfortable. And while I prefer #ownvoices, it’s not a requirement. However, I do want my mentee to be willing to ensure respectful representation, and get a sensitivity/targeted reader should the need arise. My favorite MG books at the moment are: Paper Wishes, Lucky Broken Girl, Counting by 7’s, The Fourteenth Goldfish, The Someday Suitcase, The Seventh Wish, The Land of Forgotten Girls, Counting Thyme, Rules for Stealing Stars, When You Reach Me, Serafina and the Black Cloak. My all-time favorite books: The Boy Who Could Make Himself Disappear, A Wrinkle in Time, Wonder, Harry Potter, Percy Jackson and the Olympians, The Thing About Jellyfish, and The Joy Luck Club. I don’t read much YA, but I enjoyed the sister sub-plot of The Hunger Games, and the amazingness of Angie Thomas’ The Hate U Give. My husband and I are movie freaks, so it’s really hard to pinpoint a favorite film. I can watch re-runs of Chuck, Supergirl, and The Flash on TV all day, while intermittently tuning in to the Food Network, National Geographic, and History channels. I’m also one of those weird people who find Dr. Pimple Popper videos gross but oddly satisfying. I adore animals—dogs and ducks, in particular. 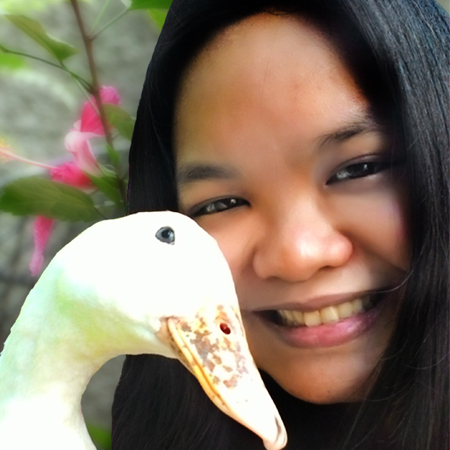 One of my Pekin ducks, Quackie, has her own Tumblr blog.